Karol Józef Wojtyła, known as John Paul II since his October 1978 election to the papacy, was born in Wadowice, a small city 50 kilometres from Cracow, on May 18, 1920. He was the second of two sons born to Karol Wojtyła and Emilia Kaczorowska. His mother died in 1929. His eldest brother Edmund, a doctor, died in 1932 and his father, a non-commissio-ned army officer died in 1941. He made his First Holy Communion at age 9 and was confirmed at 18. Upon graduation from Marcin Wadowita high school in Wadowice, he enrolled in Cracow's Jagiellonian University in 1938 and in a school for drama. The Nazi occupation forces closed the university in 1939 and young Karol had to work in a quarry (1940-1944) and then in the Solvay chemical factory to earn his living and to avoid being deported to Germany. In 1942, aware of his call to the priesthood, he began courses in the clandestine seminary of Cracow, run by Cardinal Adam Stefan Sapieha, archbishop of Cracow. At the same time, Karol Wojtyła was one of the pioneers of the "Rhapsodic Theatre", also clandestine. After the Second World War, he continued his studies in the major se-minary of Cracow, once it had re-opened, and in the faculty of theology of the Jagiellonian University, until his priestly ordination in Cracow on November 1, 1946. Soon after, Cardinal Sapieha sent him to Rome where he worked under the guidance of the French Dominican, Garrigou-Lagrange. He finished his doctorate in theology in 1948 with a thesis on the topic of faith in the works of St. John of the Cross. At that time, during his vacations, he exercised his pastoral ministry among the Polish immigrants of France, Belgium and Holland. In 1948 he returned to Poland and was vicar of various parishes in Cra-cow as well as chaplain for the university students until 1951, when he took up again his studies on philosophy and theology. In 1953 he defended a thesis on "Evaluation of the possibility of founding a Catholic ethic on the ethical system of Max Scheler" at Lublin Catholic University. Later he became professor of moral theology and social ethics in the major seminary of Cracow and in the Faculty of Theology of Lublin. On July 4, 1958, he was appointed Auxiliary Bishop of Cracow by Pope Pius XII, and was consecrated September 28, 1958, in Wawel Cathedral, Cracow, by Archbishop Baziak. On January 13, 1964, he was nominated Archbishop of Cracow by Pope Paul VI, who made him a cardinal June 26, 1967. Besides taking part in Vatican Council II with an important contribution to the elaboration of the Constitution Gaudium et spes, Cardinal Wojtyła participated in all the assemblies of the Synod of Bishops. He was elected Pope on October 16, 1978 and on October 22 began His Universal Pastoral Ministery in the Church. 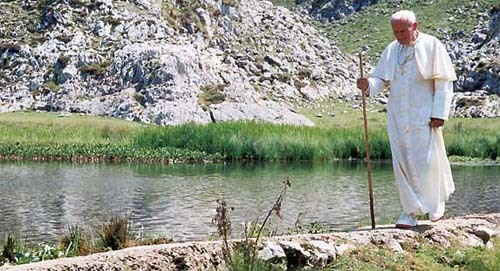 Pope John Paul II has completed 104 pastoral visits outside of Italy and 146 within Italy. As Bishop of Rome he has visited 317 of the 332 parishes. His principal documents include 14 encyclicals, 15 apostolic exhortations, 11 apostolic constitutions and 45 apostolic letters. The Pope has also published five books: "Crossing the Threshold of Hope" (October 1994); "Gift and Mystery: On the 50th Anniversary of My Priestly Ordination" (November 1996); "Roman Triptych - Meditations", a book of poems (March 2003); "Rise, Let Us Be On Our Way" (May 2004) and "Memory and Identity" (publication spring 2005). John Paul II has presided at 147 beatification ceremonies (1,338 Blesseds proclaimed) and 51 canonization ceremonies (482 Saints) during his pontificate. He has held 9 consistories in which he created 231 (+ 1 in pectore) cardinals. He has also convened six plenary meetings of the College of Cardinals. John Paul II has presided at 15 Synods of Bishops: six ordinary (1980, 1983, 1987, 1990, 1994, 2001), one extraordinary (1985) and eight special (1980, 1991, 1994, 1995, 1997, 1998 and 1999). No other Pope has encountered so many individuals like John Paul II: to date, more than 17,600,000 pilgrims have participated in the General Audiences held on Wednesdays (more than 1,160). Such figure is without counting all other special audiences and religious ceremonies held [more than 8 million pilgrims during the Great Jubilee of the Year 2000 alone] and the millions of faithful met during pastoral visits made in Italy and throughout the world. It must also be remembered the numerous government personalities encountered during 38 official visits and in the 738 audiences and meetings held with Heads of State, and even the 246 audiences and meetings with Prime Ministers. He died in Rome, in Vatican, at 9.37 p.m. on Saturday April 2, 2005. 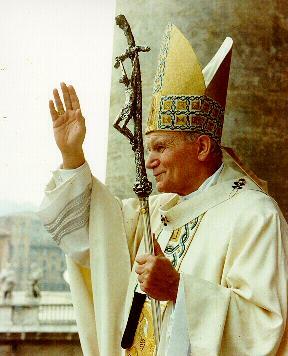 His funeral took place in St. Peter's Square on April 8, 2005.
and is the way of achieving eternal communion with you. Pope John Paul II School, with a culture immersed in an environment of a traditional Roman Catholic identity and as the school of a choice in Moore County, is available, affordable, and accessible to ALL children in the Sandhills region regardless of socioeconomic status, race, religion, ethnicity, learning challenges, or physical abilities. Pope John Paul II Catholic School is dedicated to forming the hearts and minds of our students according to the teachings of the Roman Catholic Faith and with the highest standard of academic excellence. Web Design by The Catholic Church Geek.